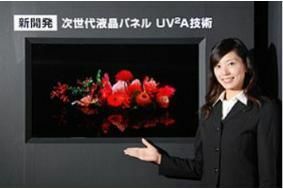 JAPAN: Sharp announces new 3D-ready core technology for LCD panels | What Hi-Fi? The company also sees its UV2A – Ultraviolet-induced Multi-domain Vertical Alignment – technology as an essential building-block for a new generation of screens ready to handle not only the demands of 3D TV, but also future 4Kx2K Super HD displays. At the heart of the technology is a new photo-alignment technique, providing highly accurate control over the alignment of the liquid crystal molecules, using a special material responding to ultraviolet light. The technique involves a proprietary polymer material in the display's alignment film: when exposed to UV light the polymers align themselves in the direction of the radiation. The liquid crystal molecules then align themselves in the direction of the polymers. The major advantage here is the accuracy with which the liquid crystal molecules can be aligned: Sharp says it's moved beyond its previous nanotechnology into picotechnology, allowing the tilt angle of the molecules, which are around a couple of billionths of a metre in diameter, to be controlled to within trillionths of a metre. – And a response time twice as fast as current models. A further bonus is that the new technique simplifies panel construction, thus making production more efficient. Sharp will be introducing this technology across the board for panels to be produced at two of its plants in Japan – the new LCD panel plant in Sakai and at Kameyama Plant No. 2. The company displayed its first prototype 4Kx2K LCD panel, a 60in model with 4096x2160-pixel resolution, some three years back. 4Kx2K is the proposed Super HDTV, or 'Super Hi-Vision', system under development by electronics companies including JVC, Panasonic, Sharp and Sony, and broadcasters led by Japan's NHK and the BBC.